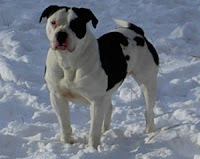 The Alapaha Blue Blood Bulldog is a very rare breed. They fall under the Mastiff breed. It is nearly extinct. There are about 150-200 worldwide. This breed results from three generations of an old breeding program of the Lane Family in Georgia, USA. The program started back in the 1800's and was intended to rescue the "plantation dog" of Southern Georgia that was nearly extinct. This rare, bulldog-type guard dog descends form Buck Lane's dog, named Otto.